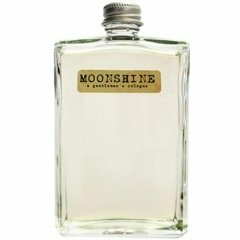 Moonshine is a perfume by EastWest Bottlers for men and was released in 2012. The scent is fresh-woody. It is still in production. Moonshine hits the skin with pepper and vetiver, that quickly combines into a tar/hay accord. I can imagine someone out in the wheat next to a claptrap still bottling some rotgut. It smells earthy, raw, Southern, real. I like it, and I thought I would. Silage is 6" but it does billow around you, effectively doubling the impact. About an hour in, it gets more perfume-like, refined and high-end smelling, a little powdery, but still masculine, more like the moonshine is now some black label sold at a specialty liquor store or something. Gets less aromatic around hour three, and it is definitely lighter, more like a tarry/earthy paper, not like you were knee-deep in the outdoors. Sigh. I wish it had continued in its initial assault; it loses potency as it dries down. Reapplying brings out more of the high-end elegant/flower accord, which is disappointing. Applying it on the back of your hand makes it last twice as long, but the initial swagger dies away just as fast. I'm not sure who the target audience is for this scent - I thought it was me! I guess it must be for those who like a little swagger to their walk, but get tired of it quickly and want to go back to their comfortable city life after an hour or two. I know this sounds harsh, but Moonshine feels like the fragrance of posers, fakers, and trend-chasers. For a much more authentic scent in this category, try out (believe it or not) McGraw (Southern Blend). McGraw is not only much better blended, but it is three times cheaper. Go figure. Write the first Review for Moonshine!